Some people say a picture is worth 1000 words. I only need FIVE to explain this picture: It’s all the same asset. This map says that Advantage Lithium (AAL-TSXv; CAD$140 million Enterprise Value) will one day be worth as much as Lithium Americas (LAC-TSX; CAD$1 billion Enterprise Value or US$800 million). LAC’s stock has had a fantastic run this year—tripling to $13 at one point this year, mostly on the strength of their 45% interest in the Cauchari lithium brine asset in The Lithium Triangle on the Argentina-Chile border. Their partner—SQM Corp. (SQM-NYSE ADR)—a major lithium producer—had a 60% run this year on this same property. LAC really is worth $1 billion just for its minority interest in Cauchari. Chilean brokerage firm BTGPactual said in a Sept 29 analyst report that SQM’s Joint Venture (JV) with LAC was worth $2 billion for its 55% working interest. It’s clear this brine asset is worth a lot of money. This is the SAME ASSET. There is no geologic fault or anything subsurface that prevents this brine from being the same across AAL land. See the drill holes AAL is drilling close to the LAC/SQM part of the asset? AAL has been pulling in great lithium grades, similar to the almost 700 mg/L that LAC/SQM have been getting the same. I REPEAT—AAL HAS THE SAME ASSET. You can walk across the two properties and not know whose side you’re on. (In fact, SQM/LAC have been caught trying to work on the wrong side recently.) Above ground and underground, this is One Big Brine Patch and each group owns a significant chunk of it. The combined value of just the SQM/LAC part of the Cauchari brine asset is US$2.8 billion. AAL owns 75% of their ground, with Orocobre (ORL-TSX; ORA-ASX) owning 34% of AAL and the other 25%. This is simple and not so simple at the same time. Assuming lithium prices stay up in the $18K-$22K/tonne they’re at now, AAL/ORL will at one point get the same valuation as SQM/LAC. Just to be clear again, 75% of US$2.8 billion is US$2.1 billion or CAD$2.625 billion. Right now AAL has 140 million shares out. Management is hoping to raise some non-dilutive capital by getting the off-taker (industry term for lithium buyer) to build the production facility. A Chinese lithium producer, Ganfeng, has already done that for LAC—so this isn’t something new or any kind of stretch. The partner will likely want up to 9.9% of AAL equity, which is another 15 million shares. Even if that gets done right here at $1 (honestly, it’s likely to get done a lot higher if AAL does get a deal like that) AND they raise another $15 million from the Market to top up the treasury…that’s still just 170 million shares. $2.625 billion / 170 million shares = $15.44/share—a long way up from the current $1/share. And let’s say I’m way off and they end up having 300 million shares out—more than double what they have now—that still works out to a value of $8.75/share. If Chairman Dave Sidoo can deliver to the Market on his idea to get some non-dilutive capital, then the stock will start to run immediately. What’s not so simple is when that will happen. SQM/LAC are much farther ahead in their part of Cauchari; construction financing is basically raised by both parties, permits are in place, they have downstream lithium processors as shareholders etc. It is forecast to be a large scale (50,000 tonnes LCE/yr) low-cost (estimated to be US$2,500/t) lithium producer. AAL/ORL doesn’t even have an official resource estimate yet. Will it be the same grade and size as SQM/LAC? The grades they have been achieving so far—over much longer and deeper intercepts than ever before—give me very high comfort level that will happen. SQM/LAC is at 11 million tonnes now of LCE—Lithium Carbonate Equivalent. The Market is expecting a 2-2.5 million tonne initial estimate out of AAL/ORL by the end of Q1 18. Drills are turning right now; it’s possible investors see the length of intercept and grades before year end. At some point—likely the second half of 2018—the Market will gain a high degree of confidence that geologically, SQM/LAC and AAL/ORL are same-same. And when that happens, AAL shareholders are going to be ecstatic. The picture says it all. It’s all the same asset. One part of it is worth US$2.8 billion right now. The other part will be too…one day. PS. One more thing. Arguably, the Cauchari asset is so big that these two groups don’t need to merge. 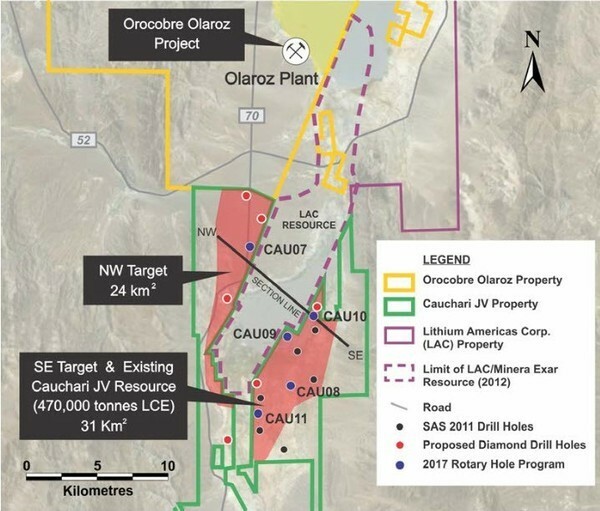 ORL is already a producer here with their Olaroz mine (doing 14.5t LCE/yr), just north of Cauchari—again, see the map above. But right now, AAL is by far the low market cap play in the area, and whomever owns it owns the balance of power in this very important lithium basin. This is the #1 lithium producing area in the world.